By custom, the surface warfare officer with the earliest Officer of the Deck qualification is recognized as the Navy’s “Old Salt” — an award initiated in 1988 by the Surface Navy Association. On Friday, that distinction will be bestowed on Adm. John Harvey, commander of Fleet Forces Command, in a ceremony aboard the amphibious transport dock ship San Antonio at Naval Station Norfolk. The current Old Salt is the recently retired Adm. Mike Mullen, who stepped back into civilian life Sept. 30 following four years as the nation’s top military officer and 43 years of service. There was no interim Old Salt, according to Ted Brown, a Fleet Forces Command spokesman. Harvey, who graduated from the U.S. Naval Academy in 1973, earned his OOD qual on Oct. 11, 1977, aboard the nuclear-powered cruiser Bainbridge. He assumed command of Fleet Forces in July 2009. Dec. 20 CLARIFICATION: According to Brown, Harvey earned his surface warfare officer or SWO pin in October 1977. He earned his OOD qual in the spring of that year. 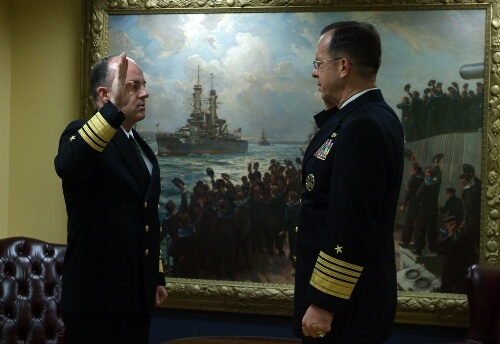 Here’s the Old Salt and the Old Salt-to-be back in 2005, when Mullen, then the chief of naval operations, promoted Harvey to vice admiral. So – there was no ‘Old Salt’ between 30-Sep and 15-Dec? Leave it to the SWOs to screw up something as simple as an award for longevity. Graduated from the Naval Academy in 1973, qualified OOD in 1977. 4 years to qualify? Is it because standards are lower now since no one takes 4 years? Why? Very interesting. To hokie_1997: Mullen apparently continued to hold the honor — “no interim Old Salt”, according to CFFC. To older Salt: Fair question. Adm. Harvey spent a good chunk of time after he graduated to attend and complete nuclear propulsion training. According to his command blog, he was about halfway through that training in the spring of 1974 when he received orders to report to Enterprise. That probably wasn’t complete until some time in 1975. He was assigned to the Reactor Department, and his first priority was completing nuclear watchstanding quals so he could become the 4 Plant Station Officer. I don’t know what all that entails, but it sounds pretty time-consuming. Per the Surface Navy Association, Old Salt is an ACTIVE DUTY Surface Warfare Officer with the earliest date of qualification as Officer of the Deck, Underway (OOD-F). No offense to the former CNO/CJCS – but he retired in late September. He should’ve forfeited Old Salt on 09/30/11. A bit minor I know, but seems silly to have an award and not follow your own rules. And despite the shrinking size of the navy, seems like lots of USN ships are running into piers/ships/buoys, etc. So clearly, doesn’t appear to be a particularly demanding, thorough, or even effective training syllabus. Makes me wonder: Are shiphandling mishaps more frequent these days or are we just hearing about them more frequently because of social media and the Navy seeming of late to hold leaders more publicly accountable?